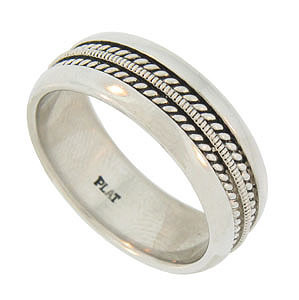 This antique style platinum mens wedding band is adorned with an elevated milgrain decoration framed on either side by twisting ropes of metal. The central design has a darkened surface and is finished with wide, brightly polished, tapered edges. 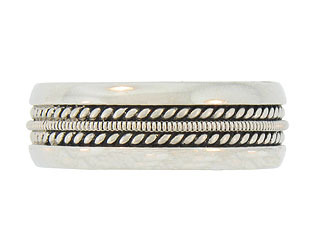 The wedding ring measures 7.85 mm in width. Size 10 1/2. We cannot re-size.